With a huge landmass and an abundance of diverse natural beauty, Russia offers a range of destinations for the Indian independent traveller. Gone are the days when a typical Indian tourist needed a travel agency to chart out a perfect holiday abroad. The young and independent traveller from India is on an exploration and discovery spree stretching from East Asia to Africa and all the way to South America. Russia is full of places that are yet to be discovered and well off the beaten track for the adventurous Indian. RIR chooses 5 places that could be of huge interest to the young and curious. When it comes to sheer natural beauty, few places on earth can match Kamchatka. The peninsula in the Russian Far East is famous for its bubbling hot springs, a myriad of snow-clad volcanoes and pristine rivers blessed with salmon in the summer and buried in layers of ice and snow in the winter. 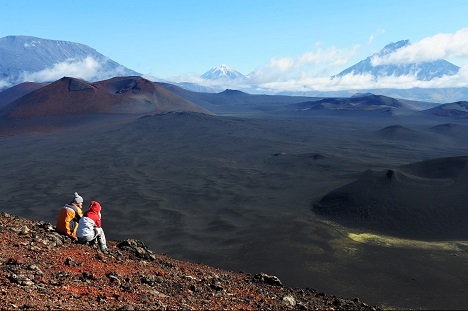 Several volcanoes in the region are easily accessible from the capital Petropavlovsk-Kamchatsky. The Avachinskaya and Koryakskaya volcanoes are even visible from Petropavlovsk. It takes a fit person around 6 hours to climb up the Avachinskaya, (2741 metres above sea level), while the Koryakskaya (3456 metres above sea level) is more demanding and takes about half a day to climb. Another major highlight of the region is the Valley of the Geysers. Part of the Kronotsky bio reserve, it has over 200 geothermal pressure valves that fire out steam, water and mud. There are several walking tours in the area. Considering how difficult it is to obtain a Ukrainian visa, not many Indians had the peninsula by the Black Sea on a high-priority list, but that problem has been solved with the Crimea joining Russia. Crimea is a place where the debate over whether visiting a hill station or the sea side comes to an end. The region has the best of both worlds, in addition to a collection of charming villages and historic forts and even some nostalgia for the Soviet days. In a recent call-in television program, Russian President Vladimir Putin even said air tickets to Crimea from Moscow would be discounted. Prices at the hotels and resorts on the peninsula would also be lower as there would be a lesser number of Ukrainian and Western tourists, making Crimea a great place for the Indian explorer to have an exotic holiday. The world’s deepest lake is one of the symbols of Siberia and Russia and a natural wonder that has few parallels anywhere in the world. It is an ideal place for rest and relaxation and to breathe some pristine air, but there is also a lot on offer for those who want to engage is physical activities. You can fish, sail, cycle and ride horses around the lake, as well as climb several of the lush green mountains surrounding the lake. For those who are looking for even greater isolation, a trip to Olkhon Island would do the trick. Also in the vicinity of the lake are some impressive Buddhist monasteries and the city of Irkutsk, which is known as the Paris of Siberia. Have you ever dreamt of seeing the northern lights? This city, which is actually north of the Polar Circle and close to the Norwegian border, is a great place to see the lights in the winter and enjoy the White Nights in the summer. Take a 14-day expedition from Murmansk to the North Pole. While some Indian travellers have set foot in Antarctica, a pioneering trip to the other end of the world would earn some bragging rights. Murmansk is also a great base to explore the Kola Peninsula, where you can spend time with reindeer herders. Some communities welcome visitors and offer a home stay arrangement in the some of the most difficult climatic conditions on earth. Imagine a city completely European in nature and character, but is much closer to Tokyo and Beijing, than it is to Moscow. The jewel on the Amur River has a Mediterranean feel in the summer and is as cold as Siberia in the winter when temperatures fall to 40 degrees below zero Celsius. Most travellers on the Trans-Siberian route bypass Khabarovsk on their way to Vladivostok, but that would be a big mistake. The city has splendid and well-preserved architecture from the turn of the 19th to 20th century, broad and well-laid boulevards and the finest riverfront in the Asian part of Russia. The city is close to the taiga that hosts some incredible wildlife, including the Amur snow leopards and the Ussuriski Tigers, the world’s largest species of India’s national animal. It’s also possible to trek to a peak from where you can see the natural boundary between Russia and China.